Hi, I’m Jolyon Dodgson, this is my site. I am a native English speaker. I come from the UK. But I now live in the North East of Thailand, the Isan Region, with my wife and little boy. I have a BSc in Ecology with Biology, MSc in Plant Breeding and Biotechnology, both from the University of East Anglia, UK, and a PhD in Plant Pathology from the University of Hertfordshire, UK. I am also a qualified TEFL (Teaching English as a Foreign Language) teacher with an additional certificate specializing in English grammar. I have worked in a university in the UK, as a research assistant and hourly paid lecturer while studying for my PhD and then during my one year post-doc, where I co-supervised and worked with MSc and PhD students whose first language was not English. I read and corrected their theses and academic papers. Then I moved to Thailand, with my wife who is Thai (we worked in the same office in the UK while obtaining our PhDs). In Thailand I work in a Faculty of Science in a University. I teach the English for Science course to the second year undergraduates. The course mainly focuses on reading and writing, including the grammar skills specifically needed by scientific writers. I also teach the PhD students about the English they should use when writing research papers. I proofread all the academic publications from the Faculty of Science - the departments of biology, chemistry, mathematics and physics. I have also done extensive proofreading for the Faculty of Nursing. I have given private English lessons when requested, where I generally focus more on speaking and listening rather than reading, writing or grammar. I enjoy both teaching ESL and proofreading. I have gained a lot of experience while working at the university. I enjoy proofreading the papers and helping all my colleagues get their work published. I've found that I have a talent for proofreading; which is possibly quite natural as I'm normally focused and pay attention to the details in everything I do. I have experience of proofreading many different kinds of material including; text written by English as a second language (ESL) students, academic papers, as well as MSc and PhD theses. If you'd like me to proofread, copyedit or correct any of your writing please go the page about my service for your documents. If you're unsure or would like to see an example of my work I offer a free trial edit. If you've any questions you can contact me. While I specialize in scientific and academic writing I have experience of proofreading many different kinds of documents. I can proofread any non-fiction (website, business, personal or memoir) writing or fiction writing. Alternatively if you need any help or would like to ask some questions you can visit the Excellent Proofreading and Writing Facebook page where I’d be happy to help you. You can also keep up to date with all new additions to this site at my Facebook page. If you would like any information about how I made this site, without any previous experience of website building, please go to the Solo Build It! pages where you'll find all the information you need to be successful in making websites, as long as you're willing to put effort into it. P.S. I thought of including a picture of me proofreading, but that would've been like including a picture of paint drying. 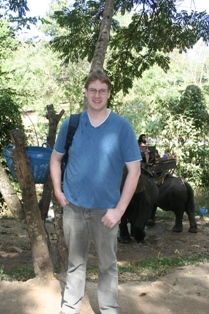 So instead, I added a picture of me with some elephants in the back ground, which are much more interesting.